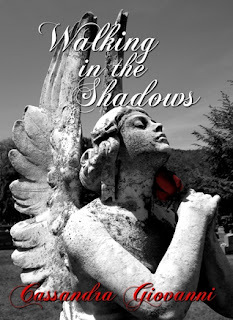 Today kicks of the Walking in the Shadows by Cassandra Giovanni Blog Tour. I am happy to bring you a book excerpt from Walking in the Shadows! Book Excerpt from Walking in the Shadows by Cassandra Giovanni! I swallowed and took one last look at the row of candles before I stood and placed the match back into the holder. When I turned Tad came into view, and I jumped in surprise. He was at the entrance, his arms crossed and his lips in a solid line. “Does each one represent a lost soul?” I asked as I looked over my shoulder at the candles that flickered against the dreary church walls. “Not necessarily, but each represents a prayer,” Tad replied, walking forward with his hands in his pockets. “How do you feel?” Tad asked as he sat beside me. “The horror of seeing their blank, lifeless, faces staring at me has ruined it,” I whispered, putting my head in my hands and wishing to push those images away. “You must have some good memories?”Tad asked, rubbing my back. Tad pulled me into his arms tight, and I breathed in his cologne to try to calm down the rapid thump of my heart. For once it wasn’t because of him, but because of the guilt that filled every part of me. “I can’t do it. When the flame goes out—they will still be dead,” I explained. “A candle can’t bring back a life; I never suggested that. But to light one will honor their memory,” he said, his voice muffled by my hair. “How? It will only flicker out and die like they did—like the good memories did,” I said, looking up into his face. Tad slipped his hand into mine and led me back up to the flickering candles. He lit the match stick with another candle and handed it to me, but my hand was shaking too much to control the flame. Tad placed his hand over mine and guided my hand to the candles. He let go of my hand and took the match stick, shaking it until it turned black. I cut him off as I stood, my blood icy in my veins, “Vampires exist in my world. Some psychopath decided that sucking the life out of a person is a fun hobby. Guess what? I had to stare at my murdered parents, had to run away from my past. You’re the only person who knows and you can stand here and laugh?” I yelled, and I ran out the door with him trailing behind knowing that he would have to stop at the threshold. I looked over my shoulder to see him with his head in his hands and his shoulders tensed with an emotion I was unsure of. I knew he hadn’t meant to laugh, and it was not so much the laugh, but the fact he had to stop at the door that upset me. No matter how close Tad and I were, we could not, would not be together. The hole where my heart had finally grown back after the loss of my parents was returning because of the very person who had filled the void. Seconds seem like a lifetime when the life you lived is slowly drained out of you by those who care not what you felt, hoped, or dreamed. When the darkness comes it is all-consuming; there is no light and there is no pain. It is the never-ending loss of hope that now consumes me as I die in his arms.This is Abigail Martin’s nightmare. After her parents become the first victims of a serial killer obsessed with the vampire saga, "Crimson Reign," Abigail does the only thing that she thinks will save her from her parent’s fate–she becomes some one else. As Vera MacIntrye, she falls in love with the very handsome Tad Knightley, and then walks into her first day at her new school to see him standing at the front of the classroom. He’s every teenage girls fantasy, but as he writes “Mr. Knightley: AP British Literature” across the white board Vera realizes the one person who filled the gaping hole in her heart will soon rip it wide open again. Vera struggles to adjust to being a ‘normal’ teenager with very adult responsibilities like paying the rent, buying groceries and making sure that lights stay on, while being drawn time and time again back to her off-limits teacher. What’s worse is he is drawn to her too, and their worlds refuse to stay apart when Tad finds Vera screaming in terror in the parking lot after the winter formal. The murderer has struck again and is getting closer to the next target–Vera. Tad will do whatever he can to save her, even if it means losing his dream job, but will it be enough when the murderer is closer than anyone ever thought?